When I was just a young lady, aged 18, I used to work at a holiday camp as a children’s entertainer, but not only did I used to look after the children, my job at 6.30pm every night was to go into the adults only bar and be the bingo caller, yes that’s right, I was there with my two little ducks, snakes alive and my top of the shop! I used to love it when someone shouted “HOUSE” although it did make me jump nearly every time. I have always loved the game and my Nan and auntie are what you would call Bingo regulars, and sometimes quite lucky too, usually around this time of year, which is great news for all their lovely grandchildren and nieces that they like to spoil at Christmas! A friend of mine went for the first time to play Bingo a few months back and returned home with a brand new television, so you can win great prizes. My nan goes off to Bingo in the afternoon, most days and she braves all sorts of weather, I have tried to explain to her numerous times that she can actually play Bingo without leaving the house, that Ladbrokes Bingo can actually set her up with an account and she can play whenever she feels like, without leaving the house. My dear Nan is not as young and spritely as she used to be, so I think, eventually she will give in and embrace the digital age. The site is very simple to use and there is even someone available to talk you through the whole process which would be perfect for my Nan. Could Christmas 2012 be the year my Nan turns computer geek…. This is a featured post, and takes me back to my younger days! On 28th November 2008 I gave birth to our fifth child Eowyn. Tyrus has now reached that age, where he has started to be more independent and loves to `feed' himself. He sits up at the table for every meal with the entire family and he eats pretty much everything that we do. I was very kindly sent a Baby's cutlery set from MAM. This set is from 6 months upwards and consists of three very sturdy pieces, that Tyrus is able to grasp very easily. The knife has a slightly serrated edge, meaning that I can actually use them to cut up most of his food, without using my own! The fork prongs are strong enough to pick up pieces of food and the spoon isn't too deep that he is unable to get the mashed potato off of it!! This set has a RRP of £5.99 which I think represents great value for money and he will be able to use this for quite a while yet, probably until he moves onto a child sized proper knife and fork set. 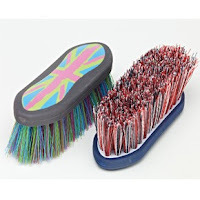 The handles are a lovely texture and the rubber on them means they are easy to grip, even when covered in food. 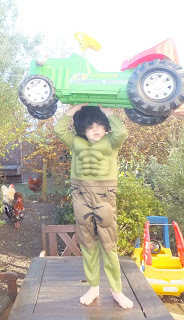 Are your children Marvel Fans, like mine ? How would they like to win an exclusive Avengers Academy Day out for themselves and 10 friends ? HOW WOULD YOU KEEP THE WORLD SAFE? Ever thought about what you’d you do if you had super powers? How would you keep the world safe in the face of danger? 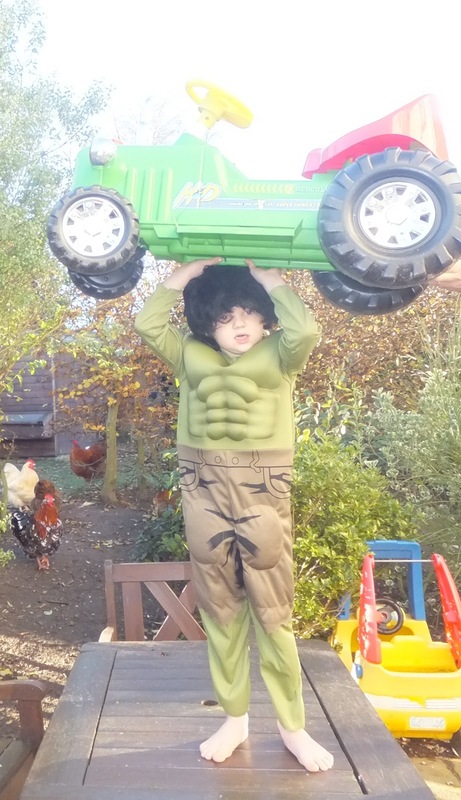 Children across the UK are being invited to share their best advice and tips on what they would do if they were a superhero for a day in an online competition launched by fancy dress manufacturer Rubie’s. All entrants are invited to submit their words of wisdom for protecting the Earth along with a photo sporting their very best superhero outfits – homemade or official. Showcasing an assemblage of super-beings, adventurers and crime fighters, all entries should be submitted via the Rubie’s Marvel Superheroes website . The best entrant will be chosen by a panel of judges and will be crowned the ultimate superhero. The lucky winner will receive the ultimate superhero prize, an Avengers Academy experience. The winner and ten friends will receive a special invitation to the ultimate Marvel themed day out. They’ll be kitted out in the latest Rubie’s Marvel costumes and will spend the day at a local kids activity centre. In between tackling the exciting activities, the team will refuel with an Avengers themed party feast and will be entertained by a special party host. The day will be topped off with all party members taking home an exclusive Avengers party bag. Launched by Rubie’s, one of the UK and Europe’s leading fancy dress costume manufacturers, the Avengers Academy competition has been created to share kids’ love for their favourite superheroes. In addition to the winning prize, the first fifty entrants will also receive a free copy of the latest Marvel movie, Avengers Assemble, on DVD or Blu-Ray. As you can see kaide got into the spirit, although I am not too sure what the chickens behind him made of the Tractor over his head and he definitely won't be dying his head black anytime soon!! I have not been blogging as long as many others, but throughout this time I have grown to love and respect a group of truly inspirational women, their blogs are warm and funny, and their support for each other is out of this world. One particular blog has captured the hearts of everyone, Kerry over at Multiple Mummy. 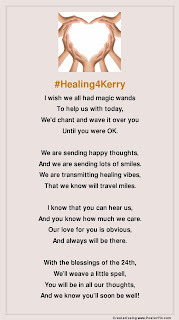 I've never met Kerry, but I have loved reading her blog. In the Summer she suffered a brain haemorrhage due to a ruptured aneurysm. Since then she has been in hospital, leaving her husband to look after their three small children and keeping the world updated through her blog. Although I have never met Kerry, looking at all of the photos and listening to so many stories, I know that if I ever get the chance to meet her, I will love her as much as everyone else does. 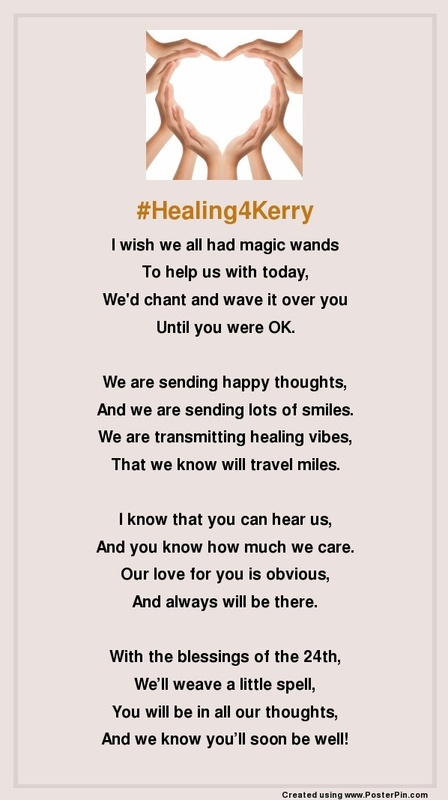 So I ask that you hand over your blog and your heart, on Saturday 24th November and let thoughts of Kerry, aka Multiple Mummy ripple through the cyber waves. Let us all say a coordinated prayer for her at 10 p.m. on Saturday 24th November. Of course if you are not religious and do not pray, then medidate, or make a wish, or do what feels right for you. WIN A Pair of Running Shoes! Calling all hard-working mums! Want to get rid of that mummy tummy once and for all? Will your New Years Resolution be to get Fit ? You are in luck, because I’ve teamed up with sportsshoes.com to offer one lucky reader a brand new pair of trainers up to the value of £90! The winner will choose a pair of running shoes up to the value of £90 which will be sent out directly. 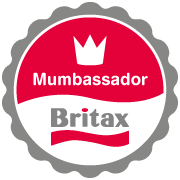 Here’s how to enter…. - Just leave me a comment below telling me what your New Years Resolution will be. 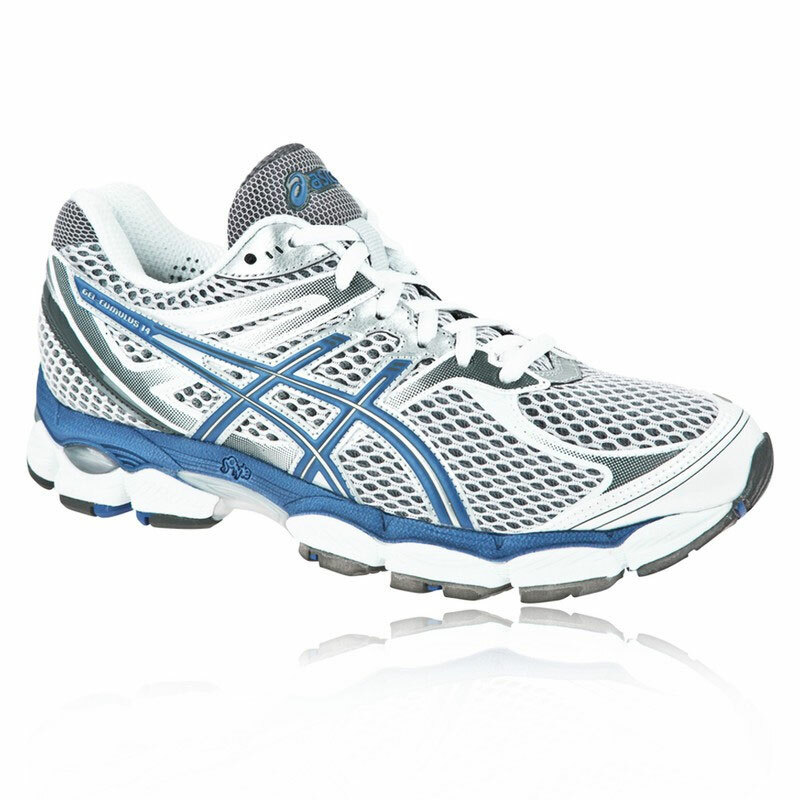 - Tweet " I want to win a pair of Running Shoe with @sportsshoes_com and @Hex_Mum"
1. Competition is only available to individuals aged 18 and over. 2. The prize will be sent out within 28 days. 3. The prize must be redeemed within 6 months. 4. The prize will be a pair of running shoes selected from www.sportsshoes.com/running up to the value of £90. 5. 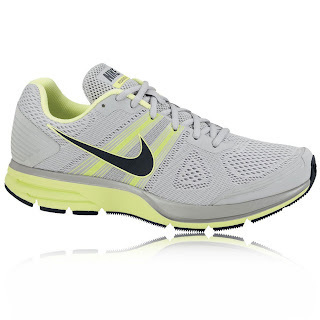 Sportsshoes.com reserves the right to provide a substitute prize of a similar value should the specified prize become unavailable for reasons beyond its control. Cash or credit alternatives will not be offered. 6. Sportsshoes reserves the right to amend, suspend or cancel the competition without notice and/or review and revise these terms and conditions at any time without giving prior notice. 7. The publisher’s decision is final. 8. The winner will need to provide their address and size for the prize to be sent. Someone at my children's school pointed out the other day that by the time Tyrus leaves their Primary School I will have attended as a parent continuously for 20 years, which made me think about the different teachers and education the children have been receiving. The school is excellent and I certainly have no complaints about any of the teaching, although sometimes I feel that it would be nice to help them when they are at home. Eowyn will be starting school in September 2013, although she attends five sessions at preschool per week. 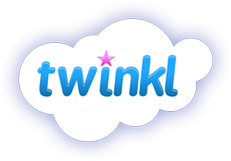 I have never been the pushy type parents and haver always said they will learn when they are ready, but with the resources I am able to download from Twinkl there are lots of little projects and fun activities that will help Eowyn prior to her starting school, don't get me wrong I don't want her to know everything, but a little assistance with letters and numbers can't hurt. As a member of the preschool committee and a school governor I have a great interest in their curriculum, and with such a vast age range of children it is great to have something to give some guidance. One of the major plus points of this website is that it is frequently updated and you can always find something relevant. Eowyn had great fun colouring in Halloween pictures and I am sure I will be busy printing out christmas ones very shortly. An excellent resource for any parent and definitely worth subscribing to, especially with such a large family, its nice to have activities to keep them amused, but at the same time, help with their learning. I love my family immensely, but I also have one other love, horses. From the age of eight I began horse riding, I loved it. I was very fortunate to have my own horse at the age of 11, and I would spend hours at the stables, I used to love the horses that were challenging and would spend many lessons trying to stay on a lively young horse, who was intent on throwing me off! Now, as a mum with six children I do not have the time needed to care for a horse, although in the future, when the children are grown up I would love to own another horse. My youngest daughter’s name means lover of horses and our middle daughter is animal mad, so I am forever hopeful that one of them may follow in my horse obsession! Whilst the Olympics were on, I spent a great deal of time watching the Equestrian events with my daughters, and the nine year old announced that she would like to be part of the England Equestrian Squad! This made me very proud, although the thought of the cost involved for her to realise her dream, doesn’t bear thinking about. 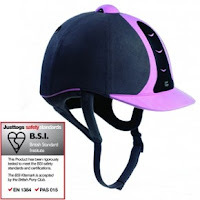 My eldest niece is also Horse Mad, and has some horsey items on her Christmas list, so middle daughter and I began browsing riding boots on equestrianclearance.com and got immersed in the entire horsey world. I used to love the smell of the tack room and Hoof Oil. She was very interested in the equipment and clothing that was available for horse riding and caring for your horse. She is a very determined young lady and I have no doubt in my mind that one day she will own a horse, or even a farm and that may be my way of rekindling my horse love! This is a featured post as I love to talk about horses! Would you like to live and work in the Garden of England? I am of course talking about the lovely county of Kent, some of you may know that I was born in Kent and lived there until the age of five, which meant I went to my very first school in Kent, I had a lovely teacher named Miss Norman, the school itself seemed huge, I have fond memories of the place, although I cried every morning that I went, being able to remember the school and teachers name 32 years later, means that it must have had an effect on me. One of my very best friends and her family have lived in Kent all of their lives and we have visited them often over the years, since having the children we have found ourselves in Kent a few times, on our way to EuroDisney. I have very fond memories of playing at The Strand and I am sure my teenage daughter would love to go shopping at Bluewater, although my nine year old daughter would prefer to go to Howletts Wild Animal Park, and the boys the Cyclopark, put these all together and that sounds like My Perfect Kent Day. Being one of the largest local authorities in the country Kent County Council Schools are looking for some amazing teachers to take up posts in their 600+ schools. I can imagine Living and teaching in Kent would be a huge lifestyle change for some people. When my husband left University in London, we decided that we did not want to live in such a busy place, and began looking at the quieter counties that still offered access to the Capital, and Kent was certainly one of the ones we considered. Kent County Council has decided to organise a Facebook competition to show potential employees what their life could be like if they were living and working in Kent. This could be a wonderful change of lifestyle opportunity for those considering a move. The entrants are being asked to submit a story on what they think their life would be like if they lived in Kent. The stories will be shortlisted and introduced to a public vote for the favourite one. The prize is an all-expenses paid weekend in Kent. So, if you know of any brilliant teachers that you think would benefit from taking a look at this beautiful county or you are a teacher yourself that would like to explore new opportunities head over to the Facebook page and enter. At my children's primary school, they begin to learn to play the recorder from the very start, in reception. I have now had four children learn to play the recorder and I have to say they are all quite good. Each time a new one begins in reception we go through the same routine, they all want a different colour so that they can recognise theirs at school, but they also do not want the same as their brothers or sisters have had. Our house does now resemble a recorder shop. Eowyn will be starting school next September and she has already shown an interest in playing the recorder, I think, because there are so many in the house!! 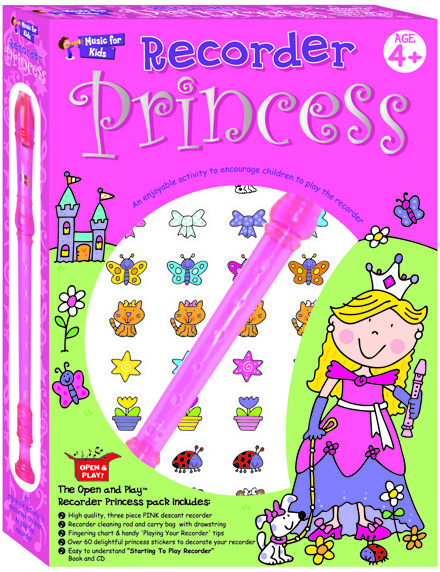 When we were given the opportunity to review the Princess or Pirate Recorder from Music for Kids, we decided to try the Princess, that way Eowyn would already be prepared for school and hopefully learn a little between now and next september. The most musical of the family so far is Neva, she can often be found playing on the piano or practicing the cornet, although she is about to swap that for a Trumpet. She has become quite good at playing the recorder, so she was also keen to test the Princess one. When we received the box, it had so much more that just the usual recorder, it came with a drawstring bag and cleaning rod. a themed finger chart and starting to play tips. The bit that Eowyn liked the most was the 60 stickers, which have been located randomly around the house as well as on the recorder. It also comes with a starting to play tutor book and an accompanying CD. It really is the complete package. Its hard work this making music!! 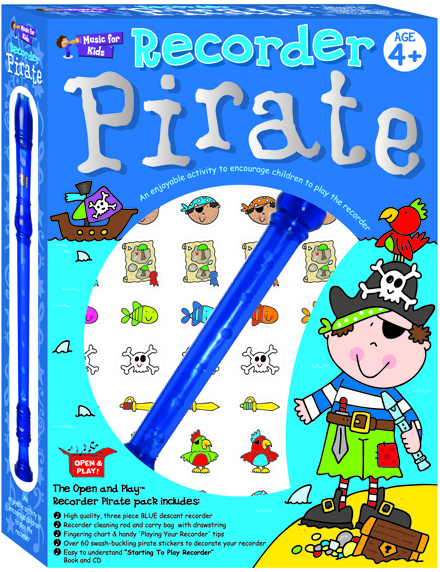 I think the sets are an excellent resource for any child wanting to learn the recorder, and if you are in the same situation as me, you have no choice but to get used to the sound of a recorder being played over and over again!! We had received a MyStyle Charm Bracelet Set in Box 1, and the girls loved it, so they were extremely excited when they were told the Mystyle Designer Jewellery Set was on its way. They love the Polymer Clay and already they had started thinking about what they could design and make into jewellery! All of the children are reading or re reading Harry Potter at present, so their designs certainly had a Hogwarts theme running through them. The actual instruction booklet has some great ideas on how to make various pieces of jewellery, but they wanted to make their own pieces which was fine. They had great fun and made lots of different things to be used on necklaces or bracelets, maybe even earrings. Neva even made a witch for Halloween, which she put with the other Halloween decorations we hung up. 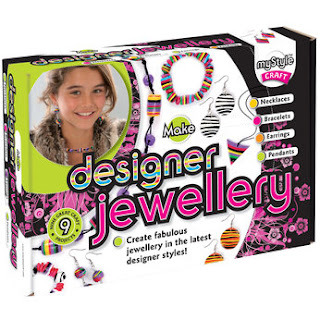 The kit itself will enable you to make great pieces of jewellery with the children, it is also great for making lots of other types of decoration! I have seen Harumika advertised lots, so I was very intrigued to find out what it was all about, the girls love dressing up ansd designing clothing, so they were extremely excited to give it a go. The Bridal Collection consists of 2 dress forms, stylus tools and an exclusive floral base stand, along with 12 chic formal length fabrics that come in the latest wedding colours and textures. Additional accessories of lace and ribbons, extra large veil fabric, rhinestone sheet and fashion stickers. As an added bonus, the packaging folds out into a mirrored dressing room. The suggested age is 6+ but all three girls loved designing and making gorgeous wedding and bridesmaid dresses, because there is no sewing on sticking involved, they could create wonderful gowns in secinds, that looked so effective. I thought the price of £39.99 was quite expensive, but after looking at the cost of material and accessories I can see why it is that price and the play and creative value that this set has given, certainly makes me think it is worth the money. You can purchase extra mannequins and make your very own fashion show. My eldest daughter is currently studying textiles for her GCSE so this collection really had her interest and she found it very easy to work with. My 9 year old daughter also enjoyed creating different dresses, and the way the material folds around the mannequin, even the 3 year old could do it. Having six children, I am sure that some of them will go to University, but that is not the only option available to them, there are other opportunities available, which offer a very different career path. Imagine having your very own James Bond in the family. The Government Communication Headquarters (GCHQ) is one of the three UK Intelligence Agencies and forms a crucial part of the UK’s National Intelligence and Security machinery, their primary customers are the Ministry of Defence, the Foreign and Commonwealth Office and law enforcement agencies. The GCHQ are now offering an Apprenticeship in British Intelligence , working with MI5 (security Service) and MI6 (Secret Intelligence Service) this is a Higher Apprenticeship like no other. Not only will you be learning about and working with the latest cutting edge technologies but you will also be earning a Salary and helping to keep your country a safer place to live. You will be based in Cheltenham, Gloucestershire. To be able to apply you need to have gained, or expect to have by September 2013, three A-Levels (or equivalent), two of which must be at Grade C or above in STEM (Science, Technology, Engineering, Maths) related subject. I think this is an amazing opportunity for young people to really get a fantastic career; it is a far cry from the YTS schemes that used to offer £29.50 per week when I left school. What are your views, do you think these kind of Apprenticeships will work, will it lead to other job sectors following suit and Offering Top Class job opportunities? The entire family enjoys playing Board Games, so we were all very interested to see how easy this would be to include everyone. We have had a few games that are just impossible to play with the younger children, which then leads to boredom and the entire game being disrupted. This game is extremely easy to set up and looks very intriguing when you first open it. There are three parts to the game Guessing, Drawing and Describing, which certainly gave everyone a fair shot at winning as I am absolutely hopeless at drawing and some of the childrens describing things is hilarious! With this in mind we all felt quite confident that any one of us could in fact win the game, and the extra special thing about this game is that there are two winners, the person that actually gets to the end square and the person that guesses their action correctly, meaning that even the person at the back (usually mum) could just as easily be crowned joint winner of the game. This is a fabulous idea and means that none of the children get disheartened if they fail to answer or guess some of the tasks. The children were also able to play the game by themselves, Neva is currently on a Drawing space and they are all trying to guess!! They all really enjoyed playing the game and none of them got bored, the timer is only 60 seconds which means the game moves on quite quickly and everyone feels included. Because all of the Logos are current, the younger ones also recognised some, which they got very excited about! An excellent game that will be enjoyed by the whole family and I am sure this will make an appearance at Christmas when we have the whole family round. 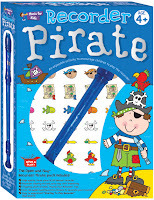 To Be in with a chance of winning this fabulous family game, just head over to www.drumondpark.com and comment below which game will be on your Christmas List this year. My daughters adore the Fur Real Range so Eowyn and Neva were very excited to open the Dizzy Dancer. It is quite a simple toy, and reminds me of the light up spinning tops I used to play with. The long stick that you push into the dancer and then release is quite sturdy, making it easy to spin, even the 3 year old was able to push it in, but unable to pull it out quick enough to make her spin, so I would say the age of 6+ is quite a good estimate if they are playing with it by themselves. We were sent Kizzy Claws, along with a little stunt stand, although I have to confess, we have been unsuccessful in doing the tricks!! Tyrus, aged 17 months was fascinated by Miss Claws and spent many minutes just watching her spinning and making a noise. The girls were very impressed with Kizzy Claws and loved the fact that they are interchangable, and quite reasonably priced, therefore a good toy to add to little girls christmas lists. I loved the fact that she actually turns off when not in use!! We have constant toy dogs barking or cats meowing, so this was a welcome toy that was noisy when required!! They are currently on the Toys R Us website for £7.99 which I think is the perfect little toy to buy for the special little girls in your family. Cbeebies Album Review and Giveaway -Got The Little ones Rocking! As you know from previous posts, my children LOVE music, even Eowyn and Tyrus jig around and move to the music. So, when we were offered the Cbeebies Album to review, how could we refuse ? The CBeebies channel has always had a special place in all the children's hearts, whenever they visit Nanny and Grandads house, they would immediately turn their freeview to Cbeebies. Xene, the eldest remembers the first episode of The Tweenies and The Lunchtime Song has encouraged many of my children to eat their lunches!! Its nice to have something for Tyrus to listen to when we are on the car journeys without the older children and he really seems to enjoy listening to the CDs. With 50 different songs to choose from, you certainly won't get bored, and I have found working in a nursery that knowing these songs is a must, many times when I used to ask the children to pick their favourite Nursery Rhyme to sing, they would shout out a Cbeebies song instead, so this CD could in fact earn you extra points with your children if you can recite the songs. My favourites are Timmy Time, 64 Zoo Lane and The Lunchtime Song, when I asked Eowyn which she liked best, she thought long and hard then said "Mummy, there is no Justin Bieber, so I love them all" Can't beat sibling influences, can you!! 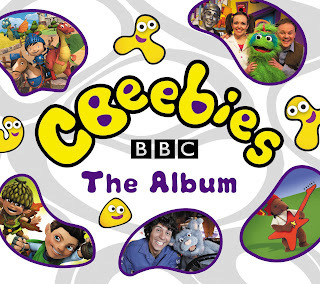 If you would like your very own copy of this CBeebies Album then please comment below with your favourite TV Programme from your childhood, and I will use Random.org to pick a winner. I was definitely a Willow The Wisp kind of girl. 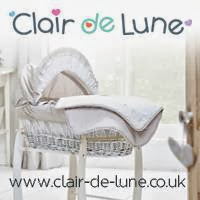 Competition only open to UK residents, the prize will be despatched to the winner from the PR company. Our seventh Toys R Us Product to review was this Thundercats Glow In The Dark 100 piece puzzle. When we first received the puzzle it did make me smile, I used to watch Thundercats when I came home from school, and here they are making a comeback!! It didn't take them very long at all. They did the puzzle in the middle of the day, so we had to wait until the evening before we could see if it did in fact Glow In The Dark!! No amount of photo taking would show up the Glowing Puzzle, but I can confirm it did Glow Up quite well. 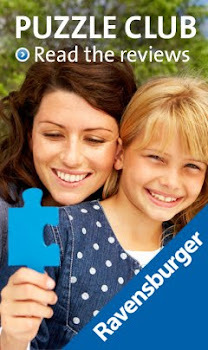 The puzzle pieces are made from strong cardboard, meaning that they fitted together well. As part of the Ravensburger Puzzle Club, we were sent a lovely Christmas Puzzle, called The Christmas Shop to review. At first glance it looked quite an easy puzzle, how wrong could I be!! Making the outside edge was fairly easy, this took very little time, but after that it became quite a challenge. There are so many different areas, with so much going on, the attention to detail on each puzzle piece means that every tiny doll or teddy is individual. I sat for a few evenings when the children had gone to bed, working my way slowly, putting the pieces together, but in the end I had to admit defeat by myself and called in other members of the family to give me a helping hand. Neva took a long time to find a home for the cat, which we couldn't find at all, then we discovered it was hiding in the top left corner, but the actual picture on the front of the puzzle has a large limited edition ribbon on it, so it really was hidden!! It was quite good timing with it being half term, so Neva, Xene and Asa all worked on it with me, with a little input from three year old Eowyn!! I would definitely recommend this puzzle, it has a lovely Christmassy feel to it and would be perfect for a family to work on together, as we have done. The sturdy pieces and fine detail make it a pleasure to do and we have enjoyed this one immensely.